This is a Texas title for a 1966 Chevrolet Corvair Corsa two-door sedan VIN #107376W138420 along with the last registration and VIN plate as removed from the car. This car does not exist anymore as I personally cut it into pieces and took it to the dump in 1977. The title is not in my name. Good luck with your bids, and thank you for looking! 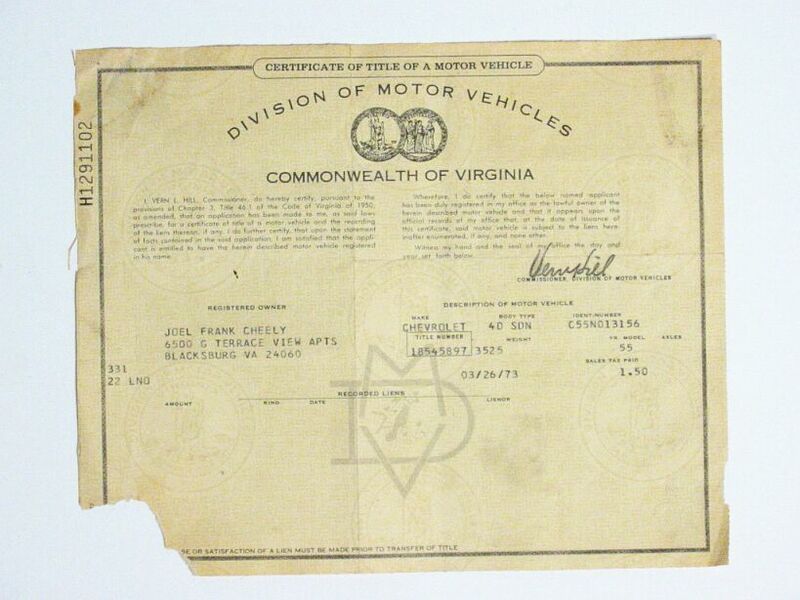 This is a title for a 1955 Chevy 4 door sedan. I doubt if chassis still exists as in 1973 it was lying on its side in a parking lot in Blacksburg, Va. Title is in my name. If you desire, I will sign title over to you. Good luck with your bids, and thank you for looking! 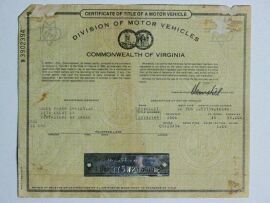 This is a Virginia title for a 1965 Chevrolet Corvair Monza four-door sedan VIN #105375W266148 along with the VIN plate as removed from the car. This car does not exist anymore. The title is in my name. Good luck with your bids, and thank you for looking! 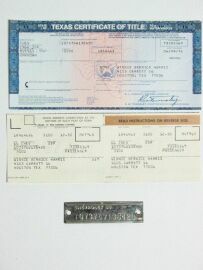 This is a Texas receipt for a 1973 Triumph Spitfire 1500 Convertible VIN #FM6561U along with the VIN plate as removed from the car, the chassis plate, and the Spitfire 1500 badge. Car was purchase at an abandoned motor vehicle auction. 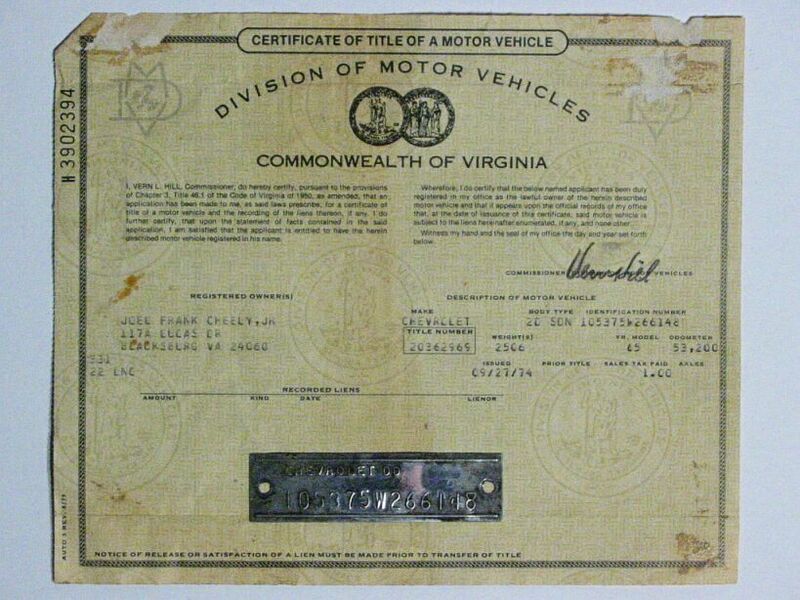 This vehicle does not exist anymore as it was scrapped in 1982. The paperwork is in my name. If desired, I will give you a bill of sale. Good luck with your bids, and thank you for looking! 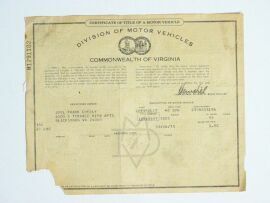 This is a title for a 1961 Volkswagen sedan (bug). It is possible that this chassis still exists somewhere but I doubt it. Title is in my name. 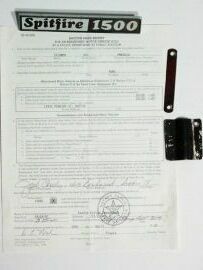 If you desire, I will sign title over to you. Good luck with your bids, and thank you for looking!